Map showing locations of 100 million image tweets shared between 09/2011—06/2014 (random sample from the complete dataset of 270 million tweets). Learn more on the project website Visual Earth. Map showing the 100 cities used in our study. The size of each circle corresponds to the total number of visual tweets shared in the central part of a given city. Learn more on the project website Visual Earth. Visual Earth is the first study to analyze the growth of image sharing on Twitter around the world in relation to economic, geographic, and demographic differences. 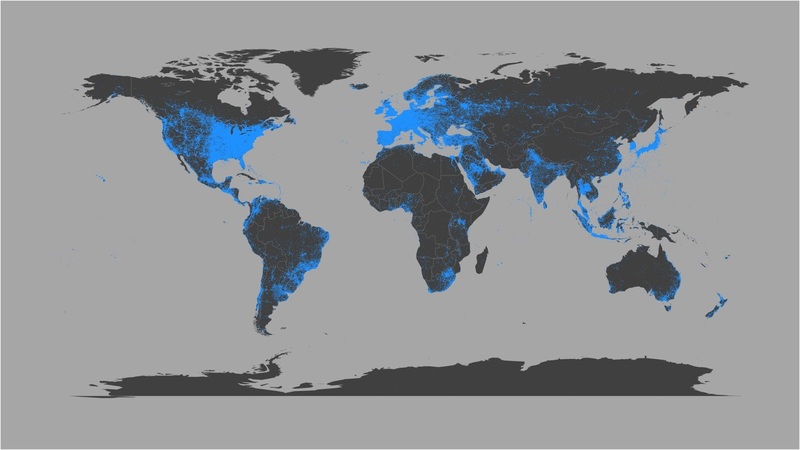 We use a unique dataset of 270 million geocoded images shared on Twitter around the world between 09/2011—06/2014. We also look in detail at image sharing trends in 100 urban areas situated on five continents. Rather than only considering the world’s largest cities or capitals, we selected these cities using different criteria to better represent the diversity of urban life today. We started with a list of 500 urban areas with at least 1 million people. We then chose 100 cities from this list. 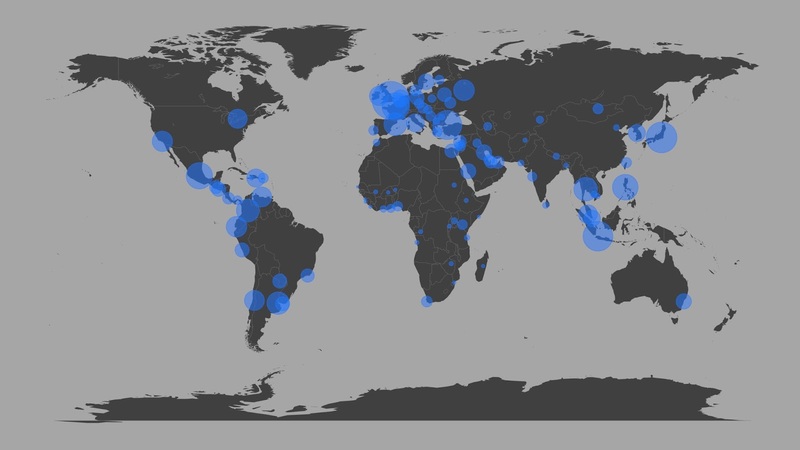 Each city needed to have at least 15,000 visual tweets, and no country could have more than one city. The cities in our list vary in size, history, culture, and global importance; they are situated on all five continents in countries with different levels of economic development. We used a popular economic classification developed by the World Bank that divides all countries into four groups based on gross national income (GNI) per capita. Our list has 20 cities in “low-income” countries, 20 in “lower-middle income” countries, 27 in “upper-middle income” countries and 33 in “high-income” countries. These differences greatly affect image sharing rates and growth over time. Visit project website http://visual-earth.net to learn more about our findings: global image sharing growth trends, geographic differences by sub-continent, relationship between image sharing and population age, as well as major trends in the visual characteristics of the images. We also propose our predictions for future growth in developing versus developed areas. Dr. Lev Manovich, Director, Cultural Analytics Lab and Professor, The Graduate Center, CUNY / project coordinator + data analysis. Daniil Sergeev, founder, Firma (New York and Moscow-based branding agency) / art direction, graphic design + web design. Agustín Indaco, Ph.D. candidate in Economics, The Graduate Center, CUNY / data analysis + economics. Dr. Damon Crockett, post-doctoral researcher, Yale University / data preparation + data analysis + geography. Dr. Mehrdad Yazdani, Research Scientist, California Institute for Telecommunication and Information (Calit2) / data preparation.